IdeaMatrix brings world-class note and idea management software to BlackBerry smartphones. Keeping track of years of ideas, thoughts, and pearls of wisdom requires an elegant application, adept at finding those nuggets years later. 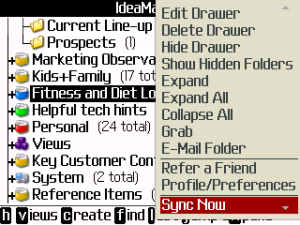 IdeaMatrix manages an unlimited number of ideas and notes, organized by an unlimited number of folders and categories. REXwireless award-winning Indy*Search allows the user to find information quickly and efficiently. As with all REXwireless professional-grade applications, IdeaMatrix features Always*Safe wireless auto-backup and optional REXdesktop.com** access. Data is safe and recoverable, even if your BlackBerry is lost or stolen. By using the REXdesktop web-access system, customers can update their data from any internet-connected PC or Mac. 7. Inject notes without re-typing from BlackBerry e-mail. 8. Trigger BlackBerry actions such as e-mail, dialing the phone, and opening the browser with links inside IdeaMatrix notes. **REXdesktop web browser access is an optional feature and is not required for BlackBerry functionality. REXwireless Software offers complimentary Always*Safe wireless backup whether or not a user chooses the REXdesktop service. REXdesktop is included for six months with a license, then $24 annually.